SAL DeTRAGLIA'S VIRTUAL TAPAS BAR: MY SALTY EXPERIENCE WITH PEPPER MILLS. Is it just me, or is it impossible to find a pepper mill that lasts more than four months? Mind you, none of these pepper mills were cheap. Each one cost $35 to $70. But without exception, each of them ground flawlessly for exactly four months and then – for no apparent reason – stopped working. Just like that. It was as if a gremlin hit squad periodically invaded my kitchen while I slept, grabbed my then-newest pepper mill and filed its grinding teeth down to a smooth, glass-like finish. I could thereafter turn the knobs or handles until my elbows fell off, but no more pepper would come out. Somebody, help me to understand! Does the production of a reliable pepper mill pose such an insurmountable engineering challenge that no grad student at MIT, CalTech or University of Illinois dares to approach it? Or are my expectations unreasonable? After all, I have for years been living under the delusion that the mechanics of a pepper mill are less complicated than those of – say – laser eye surgery, nuclear fission or printing the logo onto each individual M&M; the latter three of which, I should point out, have been scientific realities for quite some time. Yet despite years of frustration, I remain optimistic. In fact, I believe that I’ve finally cracked this nut once and for all. And the solution came from a most unlikely source: pre-Colombian Mexico. Pictured above – and I am NOT joking about this – is my newest pepper mill: A Mexican, lava rock molcajete. It crushes peppercorns effortlessly, reliably and to my exact specifications of coarseness. It adds a whole new dimension to popping sheets of plastic bubble-wrap, too. Sure, a molcajete requires fifteen seconds of clean-up with a stiff brush after each use, but I consider this a small inconvenience in exchange for – what I believe is – the last friggin’ pepper mill I’ll ever need. 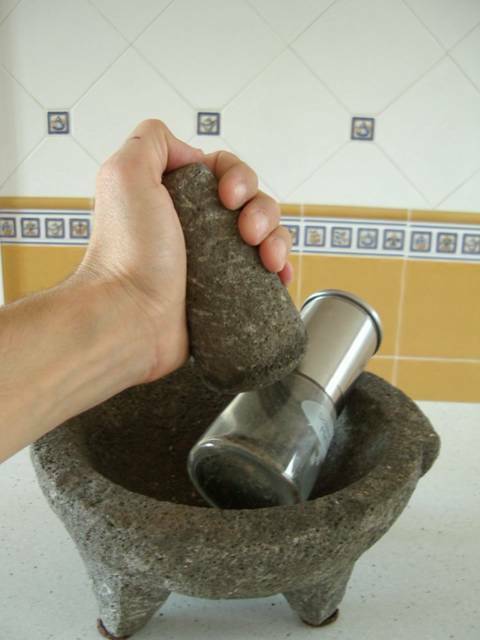 But if – four months from now – my molcajete tragically succumbs to the Curse of the Peppercorn, then I suppose I’ll have to lay down my pestle and resign myself to a pepper-free life…just like everyone else in Spain. It’s true. The people of Spain have a near-pathological disdain for pepper. They think it’s “too spicy.” If you go into any restaurant in Spain, I guarantee that there will be a salt/pepper/oil/vinegar caddy on each table…and I also guarantee that each caddy’s pepper holder will be empty. So if misery loves company, then at least I’ll have lots of company. That’s probably a good thing, because I can imagine no greater misery than a life without freshly ground pepper. Although a life without plastic bubble-wrap might come close. You are correct to ignore all Internet advice...except mine. It's been a year since I wrote this post, and I am still using the molcajete as my SOLE pepper-crushing tool. It continues to work flawlessly and quickly. What I like best (other than its indestructable construction) is that I can precisely control the coarseness of the grind (or rather, the crush). It's especially good if you like coarsely-ground pepper. Just a gentle tap-tap-tap, and you've got the perfect grind. But it's not an elegant device. No matter! When I have guests over for dinner, I just toss a handful of peppercorns in the molcajete, smash them up, pour them into a stylish little serving bowl, and set it on the table with a spoon. Guests can sprinkle for themselves. As for brands, my mother bought a pricey Peugeot two years ago and reports that it is still working well. But I'm not fooled. If I bought the same model, it would be broken within four months. Peppermills always break within four months; no matter where they're from or how expensive the are. As for your Quebec City shopkeeper, you did the right thing. I guarantee that his $100 peppermill would've been useless within four months. Well...useless, except for one thing. It would've been perfect for smashing over the shopkeeper's head when you returned to get your money back. So in summary...I am and shall remain true to my molcajete (or any other heavy-duty mortal and pestle) for pepper crushing. laser eye surgery oshkosh is a good resource. Lots of good links to helpful sites.